Some of J’s tattoos are older than most college students. J loves tattoos, but said he feels disappointed when he sees young people who have already covered themselves in ink, leaving no room to add on in the decades to come. Most of J and his wife Kristin’s tattoos are animals they designed themselves: an octopus, a seahorse, a Pisces fish. The phoenix across J’s forearm was done in one sitting in 2001, when he and Kristin moved to New Orleans. The tattoo artist, who J said relentlessly bragged about being the son of a Hell’s Angel, completed it in one hour, with a brief five-minute crack break. Kristin has two sleeves of ink, too. Unlike J, she said she was concerned about getting tattoos at first because of her professional life but decided it was worth the risk. 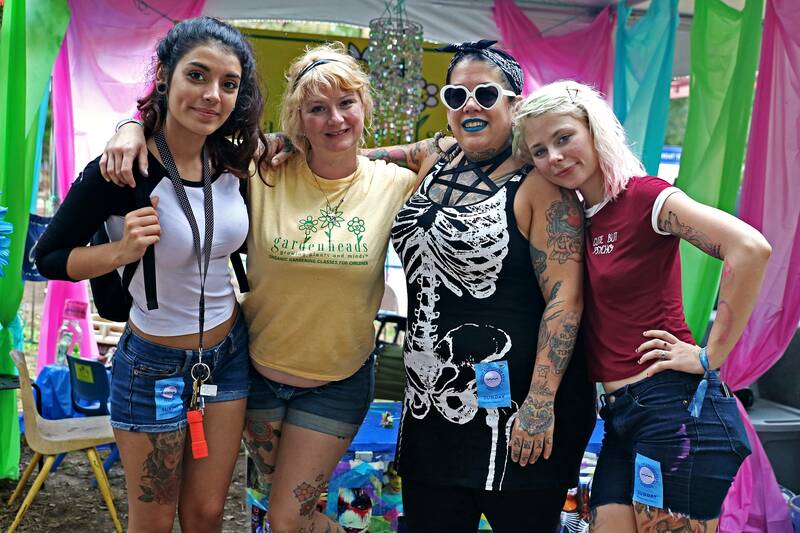 Marisa, Karla, Ivy and Camille huddled together under one tent Sunday in the Kid’s Kingdom as the rain took over Sound on Sound Fest. The women all worked the booth this weekend — and Camille inked each of them. Camille operates Gardenheads, a program that teaches children organic gardening, yoga and art. When her mother retired 10 years ago, she took over the business. She has been inking people for 20 years. After apprenticing with a local tattoo artist, she developed her own home studio, where she tattoos her friends. Karla used to substitute teach with Camille at a reform school. 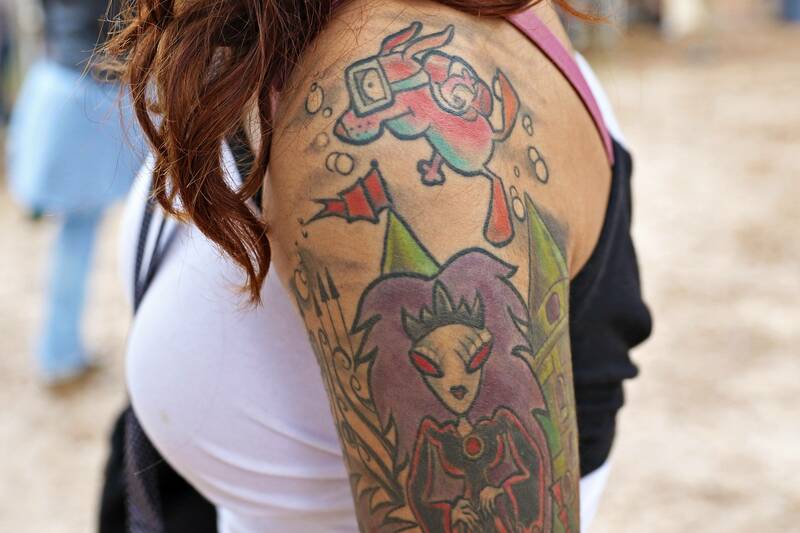 She’s a big fan of “Courage the Cowardly Dog,” a cartoon for kids, so she asked Camille to tattoo an image from one of her favorite episodes, “Queen of the Black Puddle,” on her shoulder. Camille had never seen the animated show, but watched it several times to study up for the inking. Camille tattooed matching emblems on Ivy and her best friend of 16 years. 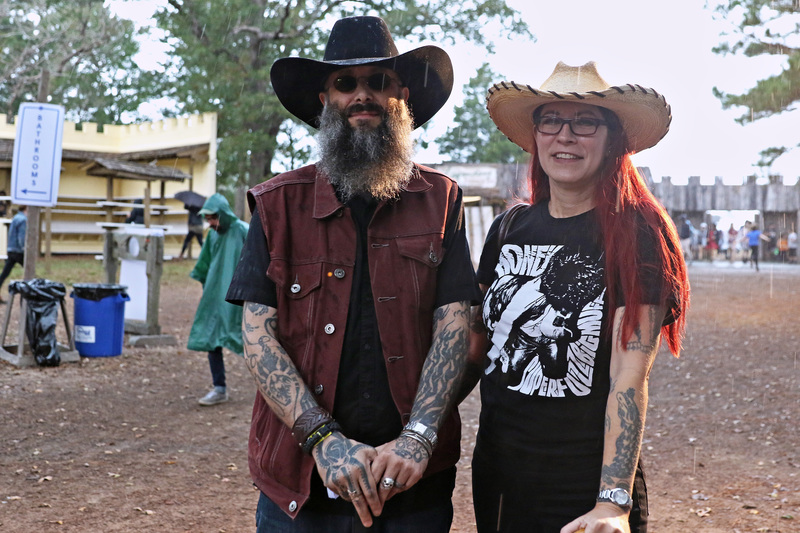 The two have been “obsessed” with the band A Perfect Circle since they were kids, and their tattoos reflect that. Marisa was her teammate in a roller derby league. 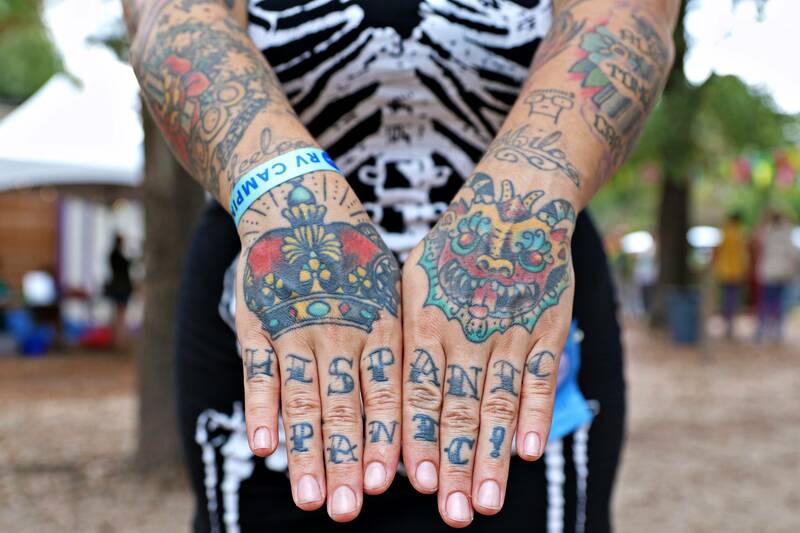 Camille tattooed a Venezuelan mask on the front of Marisa’s hand to remind her of Diablos de Yare, an enormous art festival in her home country.